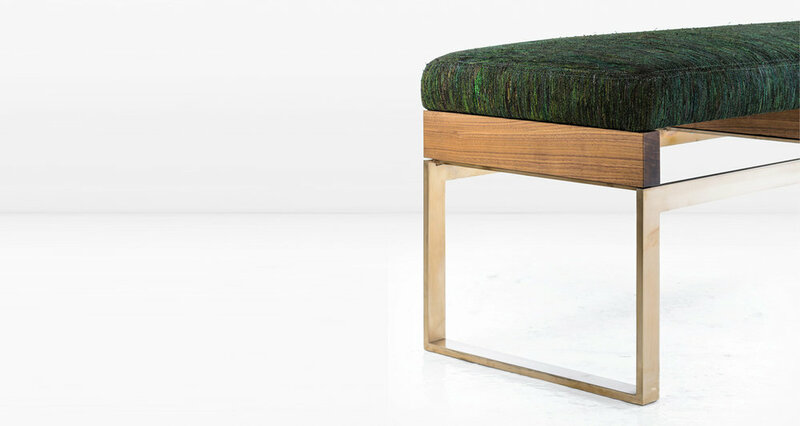 A base of metal supporting solid wood blocks which in turn support an upholstered seat. Shown in Cream suede with a Solid Silicon Bronze base and American Black Walnut blocks. 3rd image shown with Nickel base in Smoke suede. 4th & 5th images shown in Woven Peacock fabric. 6th & 7th images shown in Horsehair. Last image shown in Plum leather. Also available with Fumed White Oak blocks.